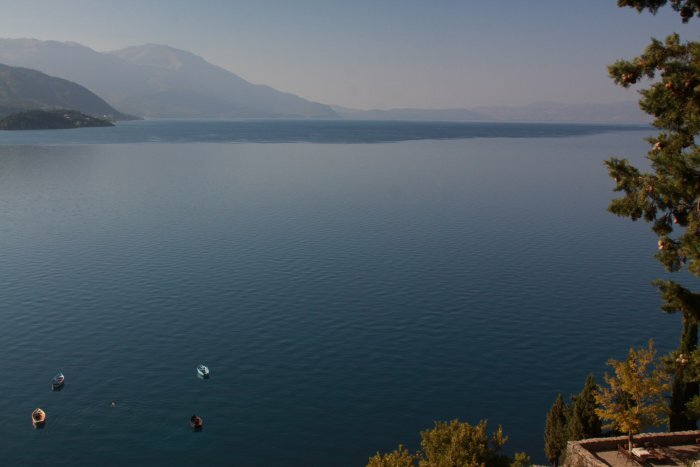 Let us set the scene for your visit – Lake Ohrid, a UNESCO World Heritage site, is one of Macedonia’s true natural gems. Here are the basics: the old town of Ohrid is the place to stay with its ancient architecture, site of Europe’s first University, site of where the Cyrillic alphabet was invented, steep cobblestone streets, small cafes and bars that are only accessible by foot or by boat and rocky secluded beaches perched at the base of steep white rock cliffs. 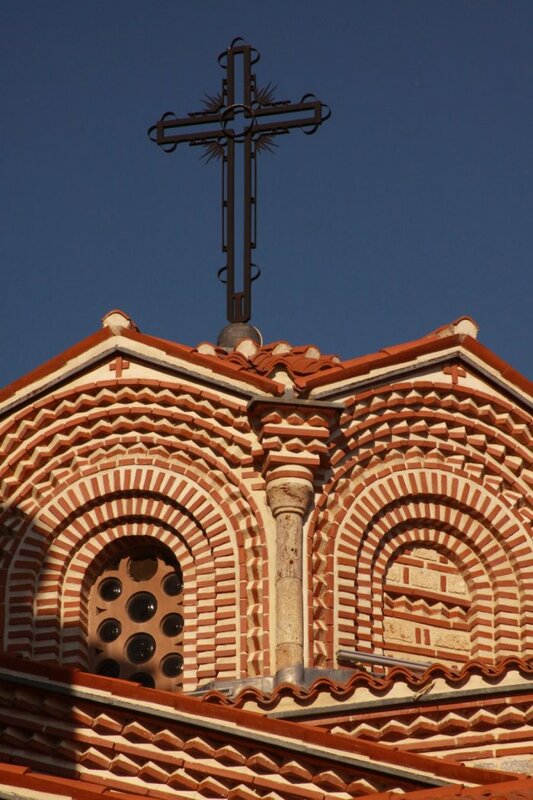 Visually the old town of Ohrid and its old world architecture set on hillsides is stunning. 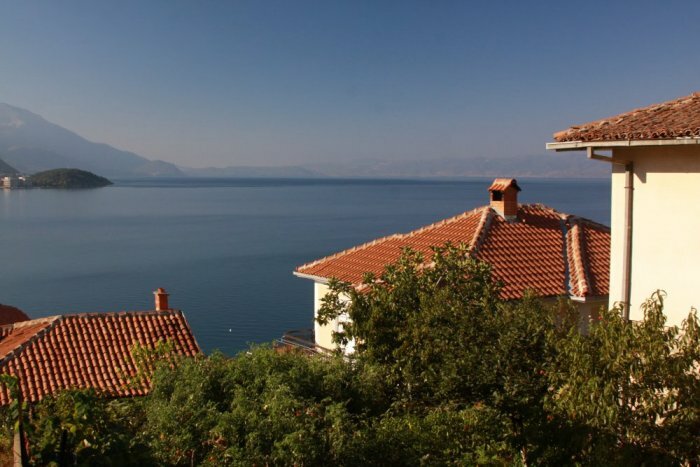 But with Ohrid, as always, the lake is the main attraction and one never gets tired of soaking up these incredible views – especially on warm clear summer days. While the lake itself is at an elevation of around 690 meters – the feel of the area is much more alpine than this relatively low elevation suggests. Mountains up to 2800 meters rise high above its shoreline and the tops of those are above tree line. 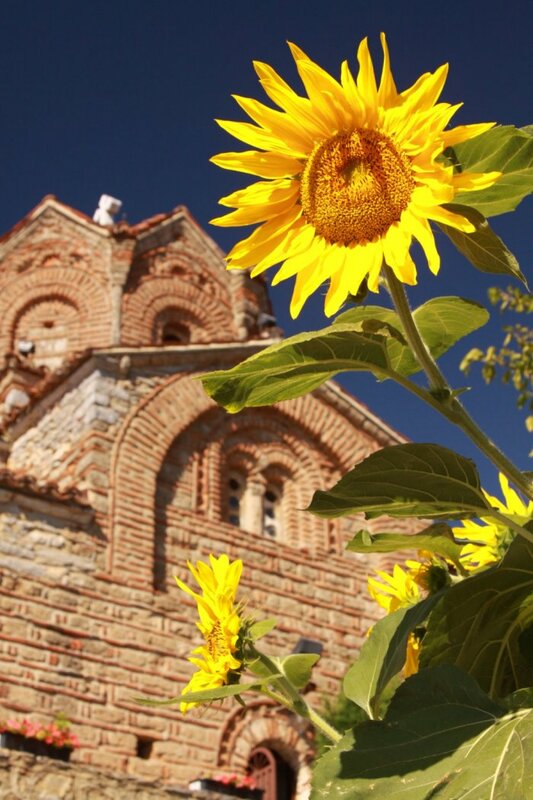 Here is the perfect day in Ohrid: It is early September – school has started elsewhere and European tourists have departed, giving you more “space” in this small town. Awaken to the first rays of sun shining through the window in your room. Like many other rooms in this part of town, you feast your eyes on the blue below you. The day is clear – like the day before and the day before that. You are merely several blocks in from Ohrid’s shoreline. You are in the heart of old town; there is absolutely nowhere else in the town one would want to stay. The streets are cobblestone and narrow. Walk down to one of the beaches in front of the cafes – put your towel on one of the floating wooden docks in the shade of a deep green willow tree that has not yet started to change color – and jump in the clear, warm water. It is early enough that the lake breezes have not yet started to blow and the water is like glass. Swim pass the buoys into deeper water – 2, 5, 10 meters – more – you can still easily see the bottom! Head back to shore, shake off and check out the local fig scene. You might have to climb into the branches but eventually you will find a ripe fig from one of the wild fig trees growing here. Then meander a few more steps onto one of the cafe balconies and order up some fresh fruit and a latte. Rest of day reads like this: read an experiential travel story (although know that you are part of one at this moment), lounge on the beach – come up for food when necessary. Do nothing. Enjoy the warmth in so many ways that this lake and its surroundings exude. The local airport, located 7km away has seasonal flights from select cities within Europe (Amsterdam, Belgrade, Dusseldorf, Vienna, and Zurich). Regular bus service is available between Skopje (about 3.5 hours), the capital of Macedonia and Tirana (about 5 hours), the capital of neighboring Albania. Villagers often rent out their rooms and if you wander around town looking for lodging or ask around, invariably someone will offer their room for rent. 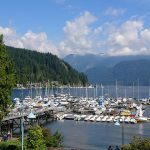 See the more information section at the bottom of this article for additional vistor websites and lodging options. 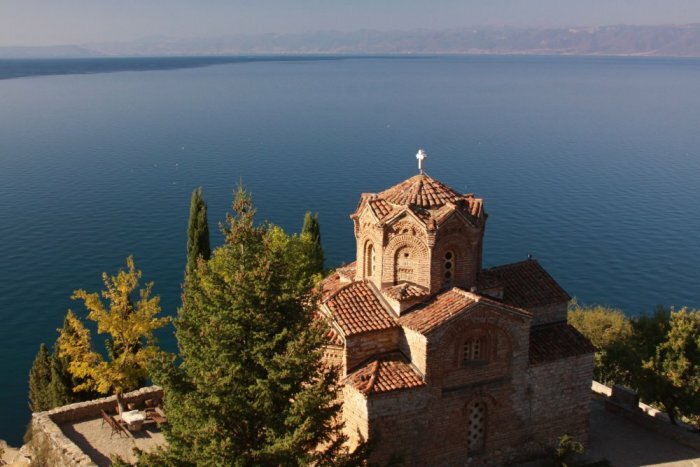 St. John Kaneo Church dates from the 13th century and visually is located in one of the most spectacular locations in Ohrid – it is perched on a cliff high above the lake. There are several small coves with rocky beaches before the pathway climbs up to St. John – these areas get very crowded in the summer months with sun bathers. Many small cafe’s and cliffside bars are located along here – get here early to secure a chair on the beach. Continuing past and above St. John’s – around the rocky point is a dirt trail that winds through pine trees high above the edge of the lake. On a clear day you just want to hover off the trail and float in the warm air above the lake soaking in this inspirational scenery. You want to become more a part of this scene than you already are – more than just by being here. The narrow trail leads to several larger beaches and depending on the time of year – are much less crowded than the beaches next to the cafes. St. Pantelejmon – Plaoshnik is located higher up the hillside from st. John’s and easily within walking distance. This is an extremely important historical site; It is where Cyrillic was invented – the alphabet that is used in Russia, a number of Eastern European countries and even in countries still further to the east. St. Klement came here in the 10th century; this was an well-known religious center. Today what is left of this ancient community is entirely in ruins – with much of the site excavated or partially excavated. A new church has been built on the edge of the ruins – small glass panes within the floor allow one to see the original foundations – there are also great views of Lake Ohrid below. Continue up the hill to the top and visit the upper most fortress walls – climb on top of these walls for great views of the entire city and lake in all directions. Shopping – the main shopping street runs perpendicular to the main harbor in the old city. A number of clothing, shoes and other boutique shopes are located here. A main plaza near the fruit and vegetable market contains a number of small cafe’s. 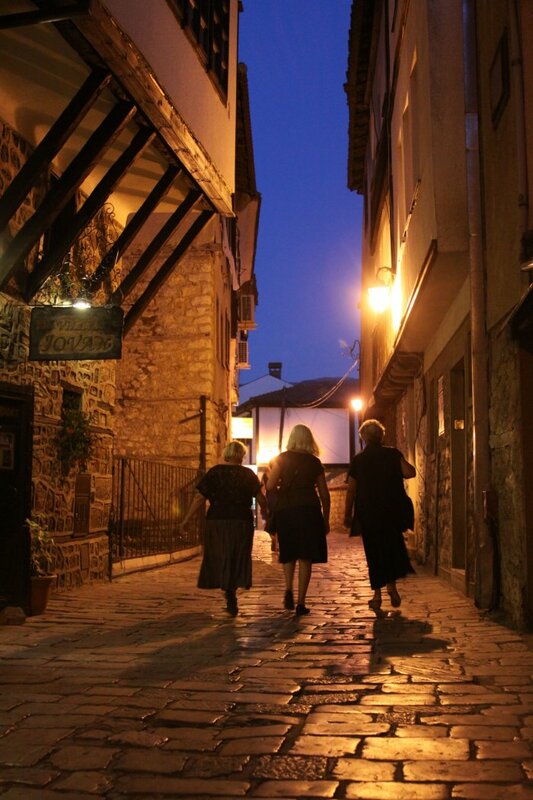 The old town also has specialty shops along the narrow and windy streets including stores selling Ohrid Pearl, artwork and handicrafts. A rather unique shop is the National “hand-made” paper workshop located in the lower part of the old city just up from the waterfront (2 streets in). This is a rare opportunity to see how parchment paper is made – a screen is dipped into water that has an abundance of floating wood pulp. The screen is raised out of the water – the white pulp covers it – and its then dipped onto an absorbing material which the paper then sticks to and is pressed and allowed to dry. Icons and artwork painted onto the paper are for sale here. Entry into the shop is free. 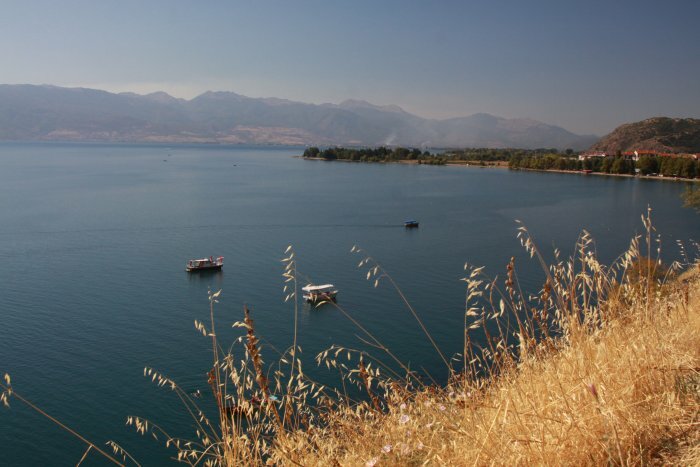 The small town of Struga is located 15 kilometers away from Ohrid – also sitting on the edge of the lake. Struga is less visited by tourists and certainly not as picturesque as Ohrid. The River Drim empties from Lake Ohrid here and in the summer the fast flowing water is popular with swimmers – past cafes that line its man made banks. The more daring jump off the bridges and let the swift water carry them for some ways until they are able to swim to safety. Kalista – is a picturesque very small town on the edge of the lake – about a 20 minute ride from Struga. You can also catch a small boat from the main dock next to the Drim Hotel. The attraction here is St. Nicolas Church and the ancient St. Atanasius Cave Church – of which partially dates from the 14th century (old frescoe’s are painted onto the ceilings). It was an wonderful trip, Dave. Thanks for letting me share the experience on your site. We did get to see and do a lot in a short period of time.I’d definitely like to go back for more! Thanks Mark – Lake Ohrid and vicinity is definitely one of Europe’s great hide outs. Next time I think I’ll spend a full month just relaxing there – taking the last few weeks of August and first few weeks in September. 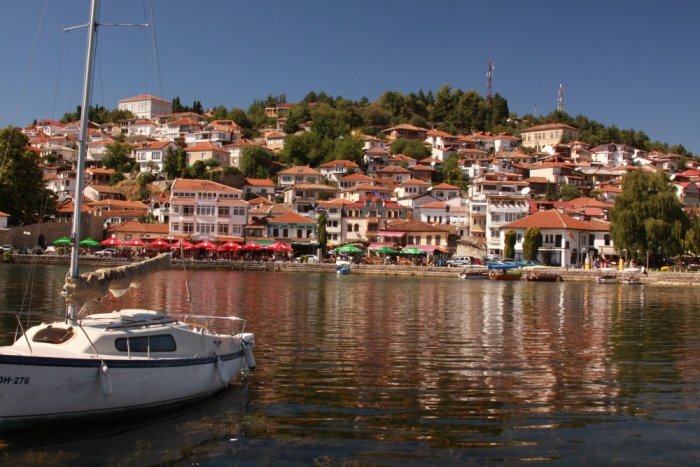 Ohrid looks like a great place to visit. Macedonia seems so beautiful place that it brings you back to 17th century. The structure of the houses and streets are very detailed and gives you nostalgia. James – it certainly is, especially Lake Ohrid. Definitely one of my top highlights for places to visit in Europe.